We've had a glitch on our move to Michigan so now looks like it will be end of July before we'll be moving. Will keep you up to date on developments. And due to the glitch that also put back our new site search engine but hopefully that will be available next week. A few of the speakers said they'd be happy to contribute an article or two to the site and so will look forward to receiving them and sharing them with you. We did get some real golf ball sized hail this week which surely made a mess with branches being knocked out of the trees. Just glad I was inside when it happened. A wee request from the MacIntyre Clan... they are looking for a local photographer that would be prepared to take photographs of their 4 day event around the Taynult Highland Games and even some video. They would like to produce a DVD after the event for the hundreds that are unable to make the event. They do have some budget set aside for this so do get in touch if you or someone you know might be interested. We have now started on the Edinburgh volume of the New Statistical Account of Scotland (1845) and thanks to Alan McKenzie for volunteering to ocr this volume in for us. You can read more about this in our regular section below. The History of Curling will be completed next week and I intend to start on the History of Tom Morris the famous professional golfer at St Andrews. I will say the copy of this book was very poor and much faded and it's taken some time to try and copy this onto the site. This weeks Flag is compiled by Jennifer Dunn and she's covering stories on Prime Minister Browns problems in getting legislation through Parliament, ongoing discussions on getting a "Scottish Six" news program and a traditional story on our infamous Scottish midges. 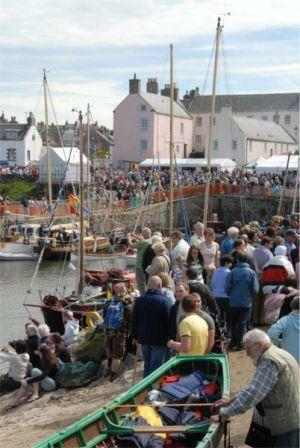 The organiser’s of the 15th Scottish Traditional Boat Festival in Portsoy have revived an old Scottish fishing tradition and banned whistling in the run-up to the festival which runs from Friday 20 to Sunday 22 June 2008. Last year the event fell foul of bad weather which the organisers hope to avoid in 2008. Their tongue-in-cheek suggestion arises from the old superstition that if you whistled at sea or near the sea, you were mocking the Devil and he might retaliate by sending gale-force winds. The festival, which is run by volunteers largely from the town’s 1,800 population hope that the ‘whistling-ban’ will ensure that the 20,000 visitors to the event will be blessed with good weather. The event features music, dance and food as well as boating demonstrations. The theme for 2008 is ‘Salmon Cobles and Silver Darlings’ which reflects that in its commercial heyday Portsoy handled both salmon and herring. Visit http://www.stbf.bizland.com/2008/ for full details. Other nautical superstitions dating back for centuries include a suspicion of all things left-handed with seafarers encouraged to lead with their right foot when stepping off their boat. Rats leaving a ship was said to be a sign of trouble to come, but the presence of a black cat was seen as a good omen for sailors. Pigs, rabbits, salmon, meeting the minister were all included in Scottish fishing superstitions in past centuries. When at sea words such as minister, kirk, swine, salmon, trout, dog and certain family names were never said. Substitute words were used eg the minister was called ‘the man wi the bleck quyte’. This column is not superstitious in the least but fingers-crossed for good weather for the Portsoy festival – and the recipe contains one of the banned fishing words – salmon! PITCAIRN, a local surname, derived from lands of that name in the parish of Leslie, Fifeshire. The family of Pitcairn of Pitcairn was one of the oldest in that county. Piers de Pitcairn, their ancestor, swore fealty to Edward I. in 1296. Nisbet (Historical and Critical Remarks on Ragman Roll, appended to System of Heraldry, vol. ii. p. 38) states that he had seen charters of this family as far back as 1417, and adds: “Of them was Robert Pitcairn, commendator of Dunfermline, secretary during the regency of Moray, Lennox, Mar, and Morton; a great complier with everything uppermost, a great timeserver, a great enemy to Queen Mary, and a very humble servant of the regents. There is no memory of him remaining.” He was one of the nine persons chosen by the regent Moray to accompany him to England in 1568, when he went to justify his proceedings against Queen Mary, and one of the commissioners for him during all the conferences at York. Calderwood (Historie, vol. ii. p. 504) calls him “a wise and trustie man.” He was appointed a lord of session in 1568, was often chosen a lord of the articles, and in 1570 was secretary of state, which office he held during the three succeeding regencies, and afterwards under James VI. After the assassination of the regent Moray and the retirement of the lords of the queen’s party to Linlithgow, the commendator of Dunfermline was sent ambassador to Queen Elizabeth to solicit her aid against them, and to signify to her that a regent would not be chosen without her appointment or consent. In 1572 he was one of the commissioners appointed to meet, “and conclude with the superintendents and ministers in the kirk, or commissioners authorized by them, anent all matters” relating to the church. The following year he was one of the commissioners who signed the articles of pacification concluded at Perth. IN 1578 he was sworn a member of the king’s council. ON 28th January 1581, with the rest of the king’s household, he subscribed the second Confession of Faith, commonly called the king’s confession. He was one of the parties engaged in the Raid of Ruthven in 1582, and in August of the following year, when colonel William Stewart, (see PITTENWEEM, baron), had regained all his favour with the king, the commendator of Dunfermline sent him a velvet purse, containing 30 four-pound pieces of gold, and desired friendship with him. The colonel straightway informed the king, insinuating that it was a bribe that he might betray his majesty, and divided the pieces among thirty of the guard. Every man bent his piece and carried it hanging at his knapsack or hat, all the way from Perth to Falkland, while the purse was carried on a spear point, (Calderwood, vol. iii. p. 721). A few days thereafter, the commendator of Dunfermline was apprehended at Falkland, where the king then was, and confined in Lochleven castle, where he remained about a month. He was set at liberty on 23d September, on finding caution to remain in Dunfermline, and about six miles round about, under a penalty of £10,000. On his death in 1584, he was succeeded as commendator of Dunfermline by the master of Gray, on whose extrusion in 1587, Henry Pitcairn became commendator. Extent, &c.—The form of this parish is irregular. As laid down in Robertson's Map of Aberdeenshire, it resembles, in some measure, the outline of Great Britain. Its average length may be about 6, and breadth about 3 miles. It is bounded on the south, by Aboyne; on the west, by Coldstone; on the north, by Tarland and Cushnie; and on the east, by Leochel and Lum-phanan. A mountain-range, whose summits are named Hill of Gellan, Mortlich, Leadhlich, and the Hill of Corse, forms, in a great measure, a natural boundary between Coull and the parishes of Aboyne and Lumphanan. Antiquities.—One of those circles of stones standing upright, so common in Britain, and called Druidical circles, may be seen on a small hill called Tom-na-hivrigh, or the "Hill of worship or justice." About the centre of the lands of Corse, there existed, at a very remote period, a chapel called Turry Chapel. The traces of its existence are still visible. The tradition regarding it is, that it belonged to the " monks and friars." The castle or fortalice of Corse was erected in 1581 by William Forbes, father of Bishop Patrick Forbes of Corse. The walls of the castle still remain, but in a ruinous condition. Upon a rocky eminence in the vicinity of the church may still be seen the remains or rubbish of the Castle of Coull. It appears to have been a fortification of considerable extent and great strength, of square form, with large hexagonal towers at its angles. The fosse may still be distinctly seen. It was the seat of the Durwards,—a family once of great influence in this district. It is a common saying still, that the church bell of Coull rings of its own accord when a Durward dies. Extent and Boundaries.- The figure of this parish is exceedingly irregular. It extends from nearly the eastern extremity of the Pentland hills to within a few yards of the sea, near Fisherrow, and from Edinburgh to within a mile of Dalkeith. It is thus nearly 7 miles long, and about 4 miles broad; In the centre, it is nearly square, but towards the east it becomes very narrow, and runs out to a sharp point for near­ly two miles, between the parishes of Newton and Inveresk on the one side, and Duddingstone on the other, in the form of a wedge. [This irregular shape arises from the circumstance, that this is, properly speaking, a united parish - the portion of it beyond Craigmillar Castle having, in former times, been connected with the chapel at Niddry.] It is bounded on the north and west, by the parish of St Cuthberts; on the north-east, by Duddingstone; on the east, by Inveresk; on the south-east, by Inveresk, Newton, and Dalkeith; on the south, by Lasswade; and on the south-west, by Colinton. Account of the Parish.- There is a very elaborate account of this parish, written by the Rev. Thomas Whyte, who was ordained minister of Liberton in 1752, and published amongst the Transactions of the Society of Antiquaries of Scotland. It will be found to contain an elaborate account of all the places and important families in the parish. Joseph Wilson was a farmer in the parish of D--. He possessed enough of the goods of this world to make him be respected by all his neighbours, and esteemed by them as the most careful, well-doing man in the parish. Joseph knew well enough the value of his riches; but still the jewel which was nearest and dearest to his heart was his only daughter, the beautiful and innocent Mary Wilson. He loved her—and his love was not greater than that of Marjory, his wife—more than all he possessed; and when rallied by his neighbours on the depth of his purse, he was wont to say, that the brightest guinea he adored was the face of his own sweet Mary. While a child she was indulged; and the smiles of her pretty round face, and her caresses and kisses, gained all her little wants from her doting parents. While the daughters of other farmers assisted in household management, she was never required to soil her fingers, but would skip and dance before her father over the fields and the meadows, and sport as the little lamb round her parent. As she advanced from childhood, her days were clad in the same fair livery of joy. She danced and she toyed, and though no longer dandled and prattling on the knees of her parents, she made them the confidants of all her light amusements and secrets, and she sang to them all the legendary ballads which she had picked up, and their hearts were still gladdened in the little offspring of their wedlock. The reader is already acquainted with the misery endured by those evicted from Barra and South Uist by Colonel Gordon, after their arrival in Canada. This was no isolated case. We shall here give a few instances of the unspeakable suffering of those pioneers who left so early as 1773, in the ship Hector, for Pictou, Nova Scotia, gathered from trustworthy sources during the writer's late visit to that country. The Hector was owned by two men, Pagan and Witherspoon, who bought three shares of land in Pictou, and they engaged a Mr. John Ross as their agent, to accompany the vessel to Scotland, to bring out as many colonists as could be induced, by misrepresentation and falsehoods, to leave their homes. They offered a free passage, a farm, and a year's free provisions to their dupes. On his arrival in Scotland, Ross drew a glowing picture of the land and other manifold advantages of the country to which he was enticing the people. The Highlanders knew nothing of the difficulties awaiting them in a land covered over with a dense unbroken forest; and, tempted by the prospect of owning splendid farms of their own, they were imposed upon by his promise, and many of them agreed to accompany him across the Atlantic and embraced his proposals. Calling first at Greenock, three families and five single young men joined the vessel at that port. She then sailed to Lochbroom, in Ross-shire, where she received 33 families and 25 single men, the whole of her passengers numbering about 200 souls. This band, in the beginning of July, 1773, bade a final farewell to their native land, not a soul on board having ever crossed the Atlantic except a single sailor and John Ross, the agent. As they were leaving, a piper came on board who had not paid his passage ; the captain ordered him ashore, but the strains of the rational instrument affected those on board so much that they pleaded to have him allowed to accompany them, and offered to share their own rations with him in exchange for his music during the passage. Their request was granted, and his performances aided in no small degree to cheer the noble bandof pioneers in their long voyage of eleven weeks, in a miserable hulk, across the Atlantic. WHAT is the Science of Curling? The question was put to us by a practical curler when he saw the heading of this chapter, and we were not surprised when he added that he had never heard of such a thing before. We are not responsible for the title. "The Science of Curling-stones" might perhaps be a better one. But we are quite prepared to defend it as it stands, and our readers, we are sure, will see the propriety of keeping the subject separate from the "Art of Curling," which falls to be treated in our next chapter. In former times curlers generally took the material that lay nearest them, and nearly every district of Scotland has at some time or other furnished curling-stones. Now, when machinery has been introduced for their manufacture, and the facilities of railway carriage are so great, it is important to know where suitable material for curling-stones can be found. In order to decide among the varieties of stone found in different districts, it is necessary to have some fixed standard or test by which to try the different varieties. This is difficult to get. In Canada, where the ice is keen the prime requisite is a stone that is not liable to break under the excessive frost. This makes Ailsa popular there. At home we have very often to play on dull ice, and this makes Ailsa popular here. But Ailsa is too big for its weight when a Canadian wants to do the port shot in his point game, and in keen ice at home it is too keen. Burnocks, Crawfordjohns, and Plantrres are neither too keen on keen ice nor too dull on dull ice, and for these reasons they rank before Ailsas as true stones. Now, whatever our test may be, when we come to decide among varieties of stone, it is apparent that the science or exact knowledge of their composition and nature must be useful. This is why we have made a "new departure," and called in the assistance of an expert to throw light on the subject. In the coloured plate which accompanies this chapter we have given illustrations of the six kinds of stone most popular at the present day. These six varieties will be found, we believe, to cover two-thirds of the curling-stones now in use, the other third embracing such stones as are found at Carsphairn, Tinkernhill, Blantyre, &c. They have all been submitted to Professor Forster Heddle, who, as one specially fitted to do so, has been asked to explain their composition and to pronounce on their respective merits. THE flourishing town of Helensburgh has a fine situation on the undulating slope rising from the shore opposite Greenock, and forms a pleasing object in the landscape as seen from the deck of the steamers sailing up the estuary of the Clyde. It was founded in 1777, by the superior of the land, Sir James Colquhoun, and was named after his wife Helen, daughter of Lord Strathnaver, son of John, Earl of Sutherland. The town is laid out after an effective plan of feus; its streets are wide, intersecting one another at regular intervals. From being a mere straggling row of humble houses in the beginning of the century, mostly situated on the shores of the shallow bay, the town has assumed the extensive proportions it now displays. Along the shore, in front of the main street there extends a sort of esplanade walk, with a break where the Established church, and the street beyond intervene to vary its uniformity. From this esplanade the various streets run far up the ascending ground, and ranges of fine villas, some of a highly ornate style of architecture, adorn either side. Handsome church spires arise from amidst the verdant flowering gardens and clumps of trees, and, in other parts of the town, the public buildings are worthy of the prosperity of this popular place. 'While, from every coign of vantage in the streets and terraces of the upper portion of the town, there are gained delightful views of the Rosneath peninsula, with its lordly castle, or palace, amidst stately fir trees, the long stretch of purple moor, and clusters of plantations round the shores of the Gareloch, the swelling forms of the noble Argyllshire mountains in the background, and the winding, wooded slopes of Pow and Shandon towards the north. Helensburgh, from its position, enjoys a great deal of sunshine in summer, and sometimes, the fervent heat is rather too much at the height of the season, unless tempered with the refreshing sea breeze. It is a favourite place of resort for those who wish to combine the pleasures of the town along with rural scenery, as they can take the steamers which sail to some of the romantic and beautiful islands and lochs in the Pest Highlands. In summer also, the railway brings down thousands of visitors, for the day, who throng the streets and esplanade, or wend their way to Cairndhu park, from whence a prospect of the Gareloch and opposite shores of Rosneath is obtained. "The first edition of this little work was privately printed for the writer's own family and friends only, but as several applications were made for copies this enlarged edition has been placed in the publisher's hands. "Not having been originally intended for publication several extracts were made without preserving the names of the authorities, which the general reader will not require, but, as the dates have been generally given, the critical reader will find no difficulty in verifying my statements. By the word "clans" is generally if not almost universally understood those of the Scottish Highlands, few being aware how important a part our clans played during the Middle Ages, and I trust, therefore, this little treatise concerning the Border, Riding or Foraying clans, Dalesmen, Marchmen or Borderers, as they were variously styled, may not prove uninteresting, as they have too long been viewed through nineteenth century spectacles, and have, moreover, been generally confounded with the Batablers or Baitablers, as the English called them, or freebooters of the Debateable Lands, [In a document of A. D. 1588, these are styled "sumtyme callit Debettable."] whose hands were against every man and every man's hands were against them. These frontier rievers, who in Scottish legal documents were generally called bordour men or broken men, acquired also about the time of James the First (1406-1437) the name of Mosstroopers, from their living in the mosses of the country. Previous to the union of the crowns in 1603, the borders and the highlands were in a state totally different from the rest of Scotland and were subjected to laws different from the remainder of the kingdom. The feudal system, which formed the principal groundwork of ancient law, both civil and criminal, had in those districts a comparatively imperfect influence. The inhabitants were divided into surnames or clans, who acknowledged no supremacy saving that of their chief, chieftain or head of their name, who might often be a person entirely different from their feudal superior or over-lord as he was called in Scottish law. The border clans have usually been considered as little better than common thieves, none apparently reflecting that the actual state of both England and Scotland was with brief exemptions one of chronic petty warfare, nor upon the general state of society in those days when the Bible and other books were almost unknown, for the first printing press in London was only set up in 1476, and printing was not introduced into Scotland until 1501.